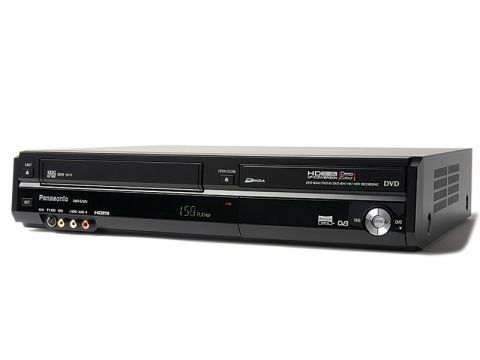 Although you can still buy standalone VCRs, most of the larger manufacturers prefer to combine them with a DVD recorder – as Panasonic has done here with the release of the DMR-EZ48V. Most people will probably fancy the EZ48V as a space-saving idea, but the added bonus of having a VCR and DVD recorder in one box is that you can copy tapes onto disc quickly and conveniently, bringing your analogue archives right into the digital age. The machine is a chunky beast, but that's a necessary evil given the thickness of tapes and the drives needed to play them. Stylishly, Panasonic has diverted attention from its girth with a smart black or silver finish and a flap to conceal the front sockets and buttons. As per the rest of Panasonic's recorder range, the EZ48V can record onto any type of blank DVD, including dual layer DVD-R and +R. Fitted inside the unit is a Freeview tuner that enables you to watch terrestrial digital TV and record it to either media. The inclusion of a single tuner is restrictive, but expected – more surprising is the lack of Freeview+, which denies you the convenience of series and split recording, as per Panasonic's DVD/HDD range. The lack of a hard disk makes the absence of Freeview+ a little less galling, but it should have been included. The EZ48V does at least offer Guide Link, which automatically adjusts timer recordings to account for changes to the schedule. The seven-day EPG makes it easy to look for programmes and set the timer, as it is laid out in a neat, logical grid that shows seven channels at a time (although you can switch to a single channel programme list) and instructions are listed at the bottom. Rear connections are comprehensive and on the front you'll find DV, S-video, composite and stereo audio inputs only. Playback can only be done from DVD or CD and the EZ48V's format support is limited to MP3 and JPEG. You get four recording modes – XP, SP, LP and EP – which offer between one and eight hours of recording time on a single-layer DVD. The Flexible Recording mode will enable you to fit something into an exact space on a disc. VHS recording offers SP, LP and EP recording speeds, while S-VHS Quasi playback (SQPB) plays S-VHS tapes in VHS quality, and the VHS Index Search System (VISS) adds index points to recordings to help you find what you're looking for. Rounding up the feature list is video upscaling to 720p, 1080i and 1080p (for Freeview and VHS pictures as well as DVD) and a range of non-linear editing tools for DVDRAM and DVD-RW discs. As ever, Panasonic's operating system is exemplary. Simply but effectively designed, the main Functions menu lists all of the options clearly, while the Setup menu covers a straightforward and uncluttered range of tweaks. There are dedicated buttons on the remote for switching between the DVD and VHS drives or selecting the various inputs, and the unit is fast at flicking though Freeview channels. Onscreen programme information, called up via the Status button or by entering the EPG, is sadly limited to now/ next information. Using the deck to back up VHS tapes is blissfully simple, as a dedicated menu guides you through each step of the process. Using XP mode to capture a selection of daytime Freeview programmes, the EZ48V does a fine job of preserving the strong colours and fine detail of the source broadcast. The garish sets of This Morning are reproduced with warmth and depth, with few traces of blocking or banding within them. Edges are crisp, fine patterns are stable and moving objects exhibit low amounts of mosquito noise. Artefacts increase gradually as you move down through SP and LP but the deck maintains solid, watchable picture quality. Only EP mode is far too soft and hazy to enjoy for any great length of time. When making VHS to DVD dubs, the results are faithful, but the final quality largely depends on the state of the original recording. It can't work miracles and remove the jitter and edge tizzing inherent to VHS but it does keep them to acceptable levels. Detail is also soft, but colours are strong and operating the VCR is a smooth process. We're also impressed by the quality of upscaled DVD playback, which makes our copy of The Matrix look crisp and clean at 1080p, with smooth edges, stable motion tracking and solid blacks. Freeview recordings are accompanied by clear, sharp sound, and VHS also sounds fine despite a faint hiss. As a music source the deck performs well, making CDs and MP3s sound balanced and lively when channelled through a good quality receiver. The DMR-EZ48V carries out its basic tasks brilliantly, thanks to Panasonic's typically slick operating system, and its picture quality is superb with both VHS copies and DVD Freeview recordings. But at this sort of money, we expected more on the features front – the lack of series recording, a USB port or SD card slot are disappointing and there aren't enough improvements over the EZ47V to justify the extra cost. The convenience is alluring, but you might be better off saving money and pairing a cheaper DVD recorder with your existing VCR.